Say it ain’t so. The far right comes to the Heights. 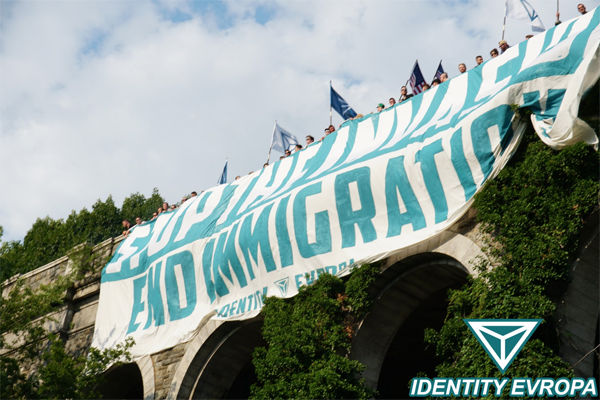 That’s right people; White Supremacist group Identity Evropa came Uptown to Fort Tryon Park on Saturday, July 28 after staging a provocation downtown at the Mexican consulate. They hung a massive banner in the park that could be seen from the Henry Hudson Parkway that read “Stop The Invasion – End Immigration.” According to folks on Twitter, the group harassed people in the park and let off smoke bombs on their way to hanging the banner. Do not let the childish antics fool you; this group is provocative and dangerous. They were among the many groups that participated in the Unite The Right rally that took place in Charlottesville, Virginia and rocked the nation last year. They proudly posted pictures on their Twitter feed (@IdentityEvropa) of their nefarious activity in our treasured Fort Tryon Park. Their message on social media was clear and unequivocal. “We will not stand by while we are replaced in the land of our forefathers-this country is ours.” This is profoundly disturbing to say the least. We can no longer pretend that we are immune to The Trump Effect. The ill winds of bigotry are now blowing through our backyard. The White Supremacist in the Oval Office has emboldened the worst elements of this society and has opened up a Pandora’s box of hatred, racism and xenophobia. This is, nothing less than, a fight for the soul of our nation. The question becomes: How will we respond? Here it is folks. Video of the Identity Evropa punks in our beloved Fort Tryon Park on Saturday, July 28th. This is such a violation. Thanks to Noah Wintman who recorded this video and stood up to them at great risk to himself. This is the Trump Effect at our very doorstep. We can no longer pretend that we are living in normal times. @shaunking – please help us spread the word and put some pressure on these scoundrels.